A few days ago, Norway witnessed the largest ever gathering of moving electric vehicles. Now, we know even more about this event. 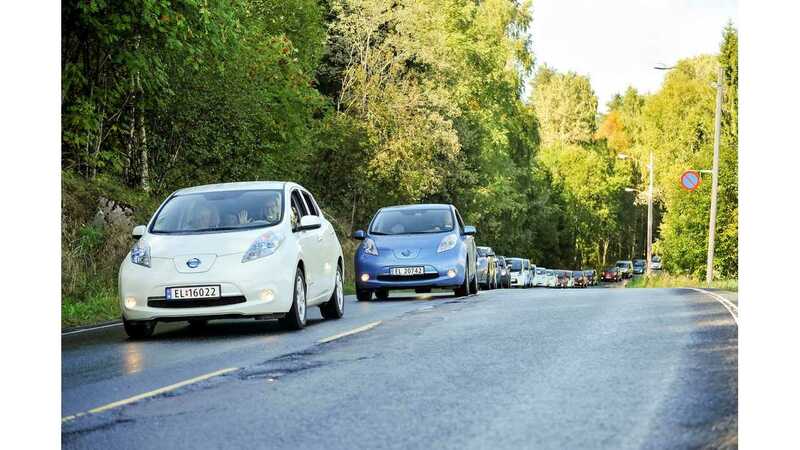 A total of 260½ electric vehicles were united to drive in unison outside of Norway's capital city of Oslo on August 31. "Starting from Maridalen in outer Oslo, the world's cleanest and quietest automotive gathering of all time followed a pre-determined 4km route and was monitored by two-camera carrying drones to ensure that all vehicles were moving simultaneously and qualified for the new world record." This number is 35½ higher than the previous record set solely by Nissan LEAFs on the Silverstone circuit in the UK in 2012. Norway's record has been set by the Electric Vehicle Union (EVU) and Norwegian EV Association in Norway. Almost half of the vehicles (128½) were LEAFs, but as we can see in the attached videos, practically all EVs were represented. "Although it was a fun event, it had a serious side. Its aim was to show that EVs are thoroughly practical everyday cars with the added benefit of producing no tailpipe emissions and very little noise. We had a customer from Hundeidvik, which is over 500km from Oslo, registered to take part using the quick charger network to get there. Norway is ahead of all other European electric vehicle markets, but many other governments and councils are watching closely and sales are increasing across the region." And yes, Norway with its 6.0% market share is ahead of all the others. Despite Norway being a small country, everything to do with EVs is done boldly there. For example, Switzerland recently adopted one LEAF for law enforcement, but in Norway the goal is to have 1,000 LEAFs in municipal service in 3 years. 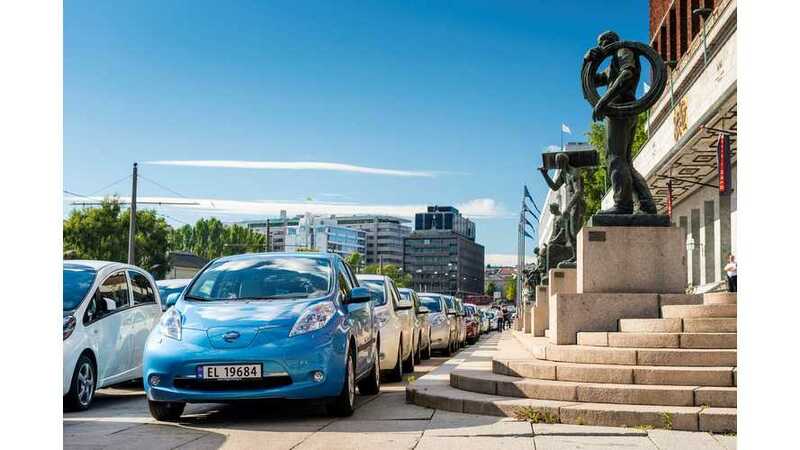 "Nissan celebrated the momentous record breaking occasion by handing over the keys to the initial allocation of Nissan LEAFs purchased by the Oslo municipality, the first of 1000 EVs the municipality will acquire over the next three years." The next goal unveiled by Nissan is to reach one billion electric km by 1st January 2015.